HDR imagery has grown in popularity over the past few years, and we are increasingly seeing cameras released that can shoot and create HDR images. The G15 also includes this facility. In HDR shooting mode, the camera takes three images: one for highlights, one for shadows and the third a normal, evaluative exposure image. The shots are taken sequentially with one press of the shutter button. Afterwards, the G15 takes a few seconds to combine the three exposures into one single HDR image. Sadly, the individual images are not saved, only the final HDR JPEG file. The results are good, and more importantly they are realistic. There is no sign of the intense local contrast-halo effect typically seen when HDR images are pushed too far. Instead, there is a nice overall contrast, with just a little more detail in the highlight and shadow areas, rather than creating an image that is almost a complete midtone. However, there are some restrictions. 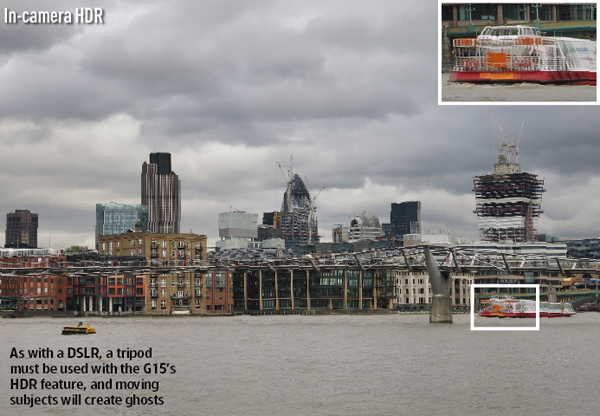 Unlike some other consumer cameras, the G15 doesn’t automatically align the images, so a tripod must be used. If not, there is bound to be some slight movement between shots, which will cause a ghosting effect on the image. Similarly, any movement in the scene will cause ghosting, the most obvious example of which is when someone moves across the scene. It is also important when taking landscape images to make sure the wind is not blowing strongly, as trees and plants may move between each image. 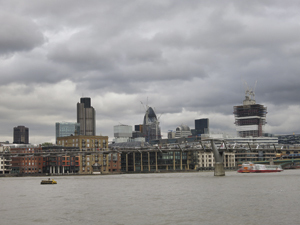 However, for most landscapes, night-time cityscapes or interior shots, the G15’s HDR option is a useful feature to have.